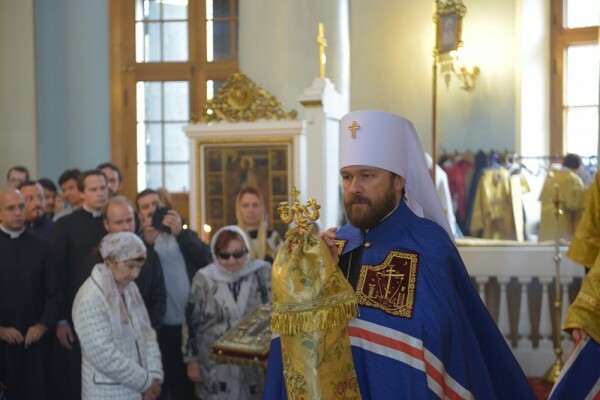 On September 13, 2015, Metropolitan Hilarion of Volokolamsk, head of the Moscow Patriarchate department for external church relations (DECR), celebrated the Divine Liturgy at the church of Our Lady the Joy to All the Afflicted-in-Bolshaya-Ordynka in Moscow. The archpastor was assisted by Hegumen Philip (Riabykh), Moscow Patriarchate representative to the Council of Europe and rector of the Parish of All Saints in Strasbourg, and the clergy of the church. The service was attended by students of the Summer Institute for representatives of the Roman Catholic Church, which is held by the Ss Cyril and Methodius Institute of Post-Graduate Studies (CMI). After the service His Eminence Hilarion addressed the congregation with a pastoral homily. He spoke about the Ten Commandments of the Law of Moses and the two commandments which Jesus Christ singled out as the most important of them, saying, Love the Lord your God with all your heart and with all your soul and with all your mind. This is the first and greatest commandment. And the second is like it: Love your neighbour as yourself (cf. Mt. 22:37-39). These are two commandments on which all the other commandments of the Law of Moses depend. It is on the commandment of love that the whole human righteousness depends, His Eminence said. ‘Let us learn from the Lord to show by our own lives that the love of God and the love of our neighbour is the greatest commandment of all. If we are lacking human ability, let us ask God to grant us this love. The Lord does not demand of people anything beyond their power. We can fulfil His commandments provided we ask God for help. And then God Himself will help us on our way to the Heavenly Kingdom’.